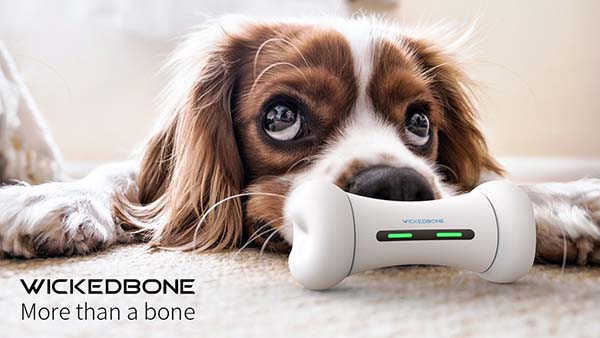 Wickedbone smart interactive dog toy has been ready to bring some fun to your fuzzy friend. All you need to do is just move your finger on the connected smartphone. Like the idea! Let’s have a look. The Wickedbone is an innovative and versatile dog toy that measures 151.5 x 64 x 64mm and weighs 300g. As we can see from the images, the dog toy shows off a bone-shaped from factor that undoubtedly matches every dog’s aesthetic taste. Meanwhile, it’s made of polycarbonate for a durable and soft design, and the FDA class material of body, cover and the tires is certified so it’s safe for humans and pets. The detachable tires make it easy to clean. The dog toy uses built-in Bluetooth technology to wirelessly connect with your smartphone so that you can use its custom app to remotely control the gaming device or choose different modes to play indoors and outdoors. Using 9 optional motions, you can create and discover new action manner combos as it runs. 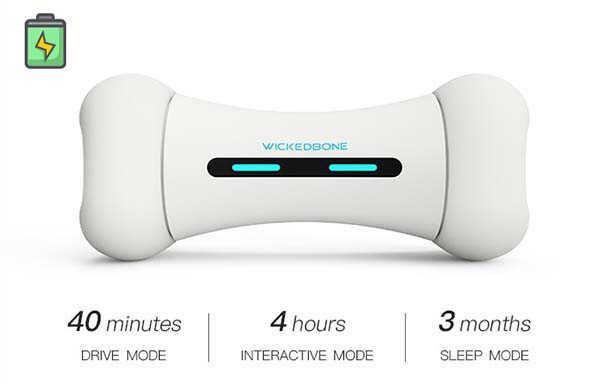 Furthermore, the Wickedbone features an innovative interactive mode that allows to attract your dog’s attention without needing manual operation. Its emotional system ensures it reacts to different actions of your dog in the interactive mode. In addition, built-in rechargeable battery offers 40 minutes of runtime in drive mode or 4-hour interactive mode. The team behind Wickedbone is raising fund for the product via Kickstarter. We can pledge $69 to preorder the smart interactive dog toy. It will be shipped in July 2018.